Harbor Care Associates is a part of the Treece Family of Home Care Solutions started in Grandville, Michigan in 1980. Our 30+ year history allows us to accurately and quickly assess your personal situation and guide you to the right resources or care solutions. We eliminate the uncertainty in navigating the fragmented healthcare system. Harbor Care Associates operates out of two local offices in Petoskey and Traverse City, providing hometown support to the people of Northern Michigan. Our goal is to help our patients stay in their home environment as long as possible, as safely as possible, and with maximum ability. We know you want to feel comfortable and safe with our staff. That’s why we carefully screen and evaluate all of our Registered Nurses, Licensed Nurse Practitioners, Nurse Assistants, and Home Health Aides. Each of our offices has a Director of Nursing that supervises and coordinates our Nurses and Home Health Aides to ensure quality care. All our staff members are required to pass a screening test, reference check, state police check, and a drug test. They will present proper identification upon arrival to your home. All staff also participate in ongoing continuing education and annual in-service training at our on-site clinical training room. Our goal is to provide a good match between you and your caregiver. We are a member of the Antrim, Charlevoix, and Emmet County Seniors (ACES), Bay Area Senior Advocates (BASA), the Petoskey Chamber of Commerce, Senior Network Advocacy Group (SNAG), and the Traverse City Area Chamber of Commerce. Harbor Care Associates is a privately owned Michigan company, providing full service home care to Petoskey, Traverse City, and Northern Michigan. Our goal is to help our patients stay in their home environment as long as possible, as safely as possible, and with their maximum ability. We employ our direct care staff; maintain workers’ compensation coverage and liability insurance. Our caregivers are thoroughly screened and supervised. Our telephones are answered by our knowledgeable and experienced staff 24 hours a day and 7 days a week. Rates are determined based on the type of services needed from 2 to 24 hours. When life changes due to an illness, accident, or aging, it can be difficult to maintain one’s independence and personal care as before. Help with errands and transportation, doctor’s appointments, personal care, medication reminders, meal preparation, laundry, housekeeping and more can relieve much of the stress you and your loved one may be experiencing. Care provided by qualified, professional and loving home care agency is an ideal option for many families and can bring back the joy in family life. 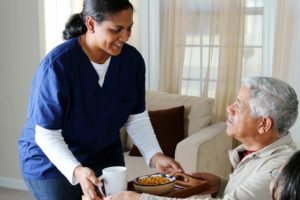 Home care is a scalable service designed to provide just the right amount and type of care needed for your specific needs.